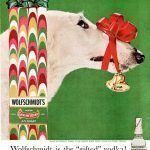 Vintage Ad Archive: Christmas Served Straight-Up! Here we are again, immersed in that most wonderful time of the year, that time of lights and wreaths and nonstop rushing around. We're in full hectic holiday mode here at Alcohol Professor Central, trying to make sure everyone knows what to drink before Christmas, and the to-do list somehow never seems to get any shorter: somehow, we need to find the time to wrap a few more presents, finish trimming the tree, mail out all those cards that we meant to take to the post office two weeks ago, make sure the fruitcake is properly soaked in brandy, hang the stockings by the chimney with care, make sure the roof has been reindeer-proofed, and practice our showstopping spotlight number for the company's karaoke caroling party. The stress and pressure is mounting, and a bit overwhelming. Which means it's the perfect time to pause for a moment and have a glass of… hmmm. Hold on. This presents a difficult question: what should we drink? What's a delightful and delicious liquid treat to sip on while we're surrounded by all this festive merry-making? 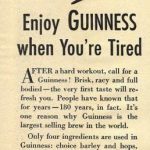 By way of guidance, I might as well dust off another stack of vintage wintery publications, unearth a few thematically-appropriate advertisements, and take another look at how we beveraged in bygone days. Sure, it's work, but as a cocktail scholar, cultural history aficionado, and total holiday nerd, it's also just plain fun. 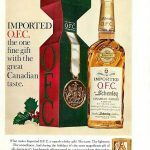 As I've shown you in past years, Whiskey has long been aligned with the holidays, helped not just by its inherent warming qualities, but also its versatility – it works wonderfully in eggnog, as the base of hot toddies, in a variety of mixed cocktails, spicing up a bowl of punch, poured in a glass with ice, or even sipped straight from the bottle in times of emergency. And ad agencies have accordingly created innumerable variations on holiday themes. Or just marketing their goods in present-ready packages. 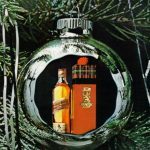 And while American and Canadian companies are ever-keen to capitalize on the season, Scotch also occupies an honored place in wintertime celebrations. Brandy always fits nicely into holiday drink menus, both as an ingredient in complex concoctions and as an after-dinner nightcap. Likewise, Vodka certainly has its share of seasonal supporters. 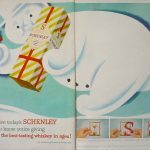 Beer is a year-round favorite, so companies have embarked on countless Christmas campaigns over the years, creating special themed advertisements in magazines, as well as special packaging and promotional items that tie their brands to the yuletide. 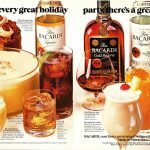 Rum, despite its tropical origins, has a place in many a holiday concoction. Flutes full of bubbly might be associated more with New Year's Eve than with Christmas, but some companies still seized the moment, and exhibited their yuletide cheer. 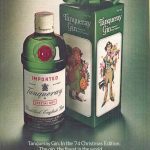 And let's not forget the entire world of cordials, apertifs, and ready-mixed beverages that have used the trappings and trimmings of Christmas to help promote their products. And in addition to manufacturers, importers and distributors chimed in from time to time, lending their voices to offer suitable seasonal selections. 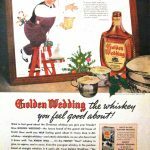 Of course, the dark side of Christmas advertising has revealed itself from time to time as well... Like that time that a sinister turtleneck-bedecked gentleman tried to convince us all that "light whiskey" would be a welcome addition to our holiday bar. Anyhow, my apologies for that unpleasant detour. Perhaps a quick dash of vermouth would kill that bitter taste, and help us regain our good cheer? But now, I'm afraid I must tun back from memory lane, and return to the realities of the present day. There's much to do, and only a few shopping days left. And since I'm no closer than before to narrowing down my holiday drink menu, I think I'll just default to the old standby, and order one of everything... I'd better make sure I can charter a one-horse-open-sleigh to carry it all back home with me. 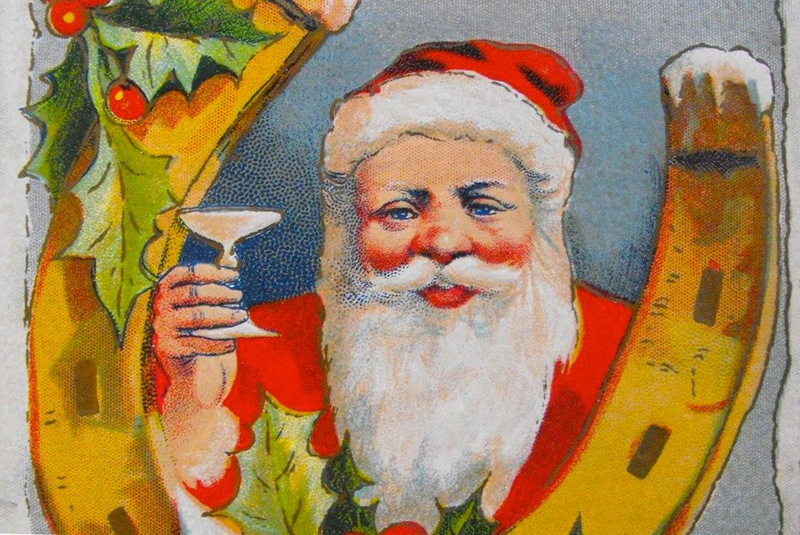 So, before I dash off through the snow, let me leave you with one last image, this sublimely off-balance Santa, captured in mid-revel on a midcentury cocktail napkin – I think it sums things up nicely. And of course, on behalf of all of us here at the Alcohol Professor, I'd like to wish you and yours a very merry holiday, and the happiest of new years!